Sriracha and mayonnaise are both all-star condiments in their own right. Combining the two only makes them better. Like peanut butter and chocolate, or milk and cookies, or Molly and EDM, or Molly AND LITERALLY ANYTHING. You could eat the sauce on its own (that's not weird... right?) 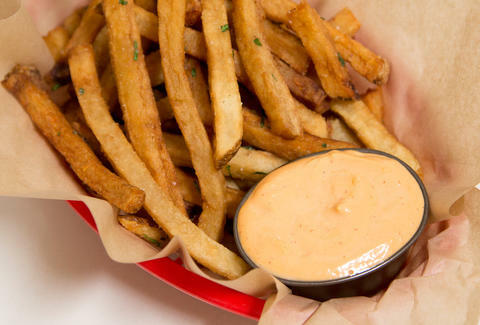 or with just about any other food, but Sriracha mayo and fries is just another one of those winning combinations. Let us know in the comments what else you'll eat it with. Molly is not a viable answer. In a medium bowl, whisk together egg yolk and dry ingredients. Combine vinegar and lemon juice in a separate bowl then thoroughly whisk half into the yolk mixture. Add oil, a few drops at a time, until the liquid thickens and lightens a bit (that’s called an emulsion). Then increase the oil flow to a constant stream. Add the rest of the lemon juice mixture. Continue whisking until it’s all incorporated. Finally, whisk in the Sriracha. It'll keep in the refrigerator for up to 1 week.